One Sunday afternoon an urgent call from Animal Services went out to all the local rescues for help. 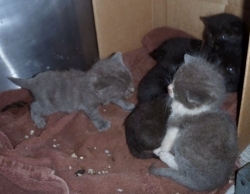 Six little orphan kittens ended out in their care and they were not doing well at all. Angie went to pick them up and after fostering them at her house for several months Wall-E was adopted to one of her family members through our adoption program. This poor litter battled through anemia, starvation, a bacterial infection, two different parasitic infections and ringworm. We weren’t sure they were going to make it a few times. We are thrilled to report Wall-E’s now not only healthy but he’s a happy boy in his new home. After we donated all the medical care they required the rest of the litter was adopted through Forever Homes Cat Rescue and they are all doing fantastic as well.